Imagine a Land where the wonderful world of Disney comes alive. Imagine a Disneyland Park, where make believe is real. And Walt Disney Studios® Park, where the magic of Disney meets the magic of cinema. Imagine a Disney® Village, where fun and entertainment stay open day and night. Seven Disney Hotels, where sweet dreams come true in the heart of the magic. Imagine you are here... In a Resort as big as imagination. Welcome to Disneyland® Resort Paris. A holiday destination like no other. Someone you know, can't wait to go. So come live the magic. Today! Check available dates. 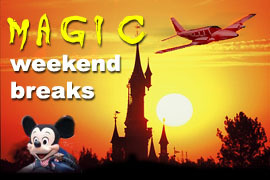 European Executive weekend Disney Break Packages include return flights from Shoreham on our PA23 aircraft for parties up to 5 persons, transfers to and from your Resort Hotel for 1 or 2 night stays and your Park entry fees during your duration of stay.